One of the first collections I processed at Burke was MRL2: Mary Lewis [Mrs. W. A.] Shedd Papers, 1918. This journal made an impact on me not just because of the first-hand account it provides, but also because this copy appears to be completely unique. 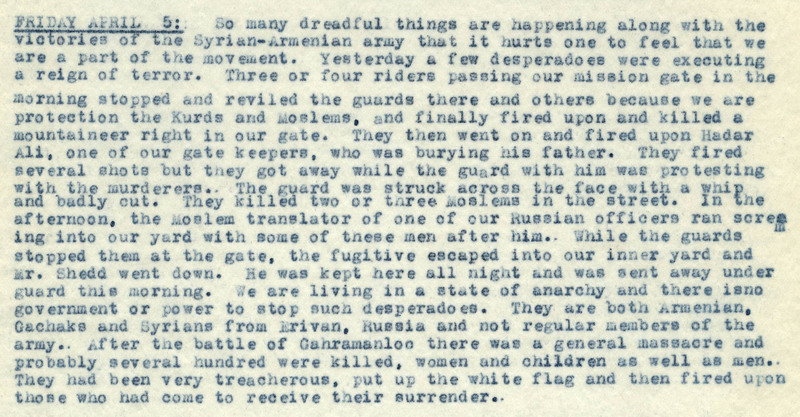 The collection is comprised of a 42-page typed copy of Mary Lewis Shedd’s journal, which gives in great detail the events from February to October, 1918 in Urmia, Persia (written as Uremia or Urumia by Shedd) and the withdrawal of Assyrian Christians. Along with experiencing this directly, she was privy to other information because of her husband and includes this in her journal. The journal has been published as The Urumia Exodus: More Leaves from the War Journal of a Missionary in Persia. The collection available at the Burke contains more detail and entries than the published version. "Fifty thousand hunted, terror stricken refugees had passed on, the desolate, rocky mountains loomed above us, darkness was all about us and heaven too far away for prayer to reach." Mrs. Shedd’s group escaped further from the warzone with the aid of the British towards Iraq, and buried her husband along the way, about seven miles east of Sain Kala. Mary reached Hamadan August 24. On October 2, she wrote that probably seven or eight thousand died, were killed, or were taken prisoner on the journey she had recently completed. Mary would later write a biography of her husband, The Measure of a Man: The Life of William Ambrose Shedd, Missionary to Persia, published in 1922. While not much more is known about her life, she continued her work as a missionary. She appears in New York Passenger lists in 1919; 1930; and 1933. Microfilm copies of Mary Lewis Shedd’s passport, and New York Passenger Lists are available at the National Archives and Records Administration. All images from: MRL 2: Mary Lewis [Mrs. W. A.] Shedd Papers, The Burke Library Archives (Columbia University Libraries) at Union Theological Seminary, New York. Mary Lewis Shedd’s first journal was published as a fifty-one page monograph, The War Journal of a Missionary in Persia , available at the Burke Library, Union Theological Seminary (see MRL Pamphlet 1890 and 2069). The second journal is The Urumia Exodus: More Leaves from the War Journal of a Missionary in Persia . This can be found at the William Smith Morton Library, Union Presbyterian Seminary, and in the Special Collections of Northwestern University (http://nucat.library.northwestern.edu/cgi-bin/Pwebrecon.cgi?BBID=1940338). The New York Public Library has it available on microfilm (http://catalog.nypl.org/record=b14791152~S1). Mary Lewis Shedd’s biography of her husband, The Measure of a Man: The Life of William Ambrose Shedd, Missionary to Persia was published by the George H. Doran Company: New York in 1922. Many libraries have the book, and it can also be found online in its entirety (http://www.archive.org/stream/measureofmanlife00shedrich/measureofmanlife00shedrich_djvu.txt). This entry was posted in Collections and tagged Diary, Journal, Missionaries, Missions, MRL, MRL2, Persia, Shedd, Urmia, Urumia on September 11, 2012 by Brigette C. Kamsler.